< Exploring the Delft School’s microscope collection – 1. My personal project to find the descriptions of methods buried in Van Leeuwenhoek’s letters and to try and work out how he did things that he didn’t describe continues. My most recent results have now appeared in the Nov 2017 FEMS Letters with the POI: https://doi.org/10.1093/femsle/fnx247. The paper covers problems encountered with using the classical microscopes with some samples that we know he studied, and suggests a solution. Antoni van Leeuwenhoek did not limit his research to microorganisms. Indeed, he worked with a very wide range of samples ranging from wood and animal tissues through insects to individual cells and sperm to bacteria. His microscopes work very well with transparent samples where the light can pass through them (and the samples were small) but, as can be seen from Figure 1, he was obviously also using reflected light. Figure 1A shows a drawing of a gnat, taken from a 1702 Van Leeuwenhoek letter. Figures 1B and C. show a similar insect photographed under a 19th century Carl Zeiss Jena microscope with transmitted (B) and reflected (C) light. It is clear that the level of detail shown by Van Leeuwenhoek cannot be observed on the silhouette shown in B. The details are all in my papers, but my conclusion is that, as he did with his aalkijkers (his microscopes for viewing the blood in the capillaries of the tails of small eels and fish where the sample pin was replaced by a glass tube to keep the specimen alive), Van Leeuwenhoek adapted his magnifiers to suit the task in hand. 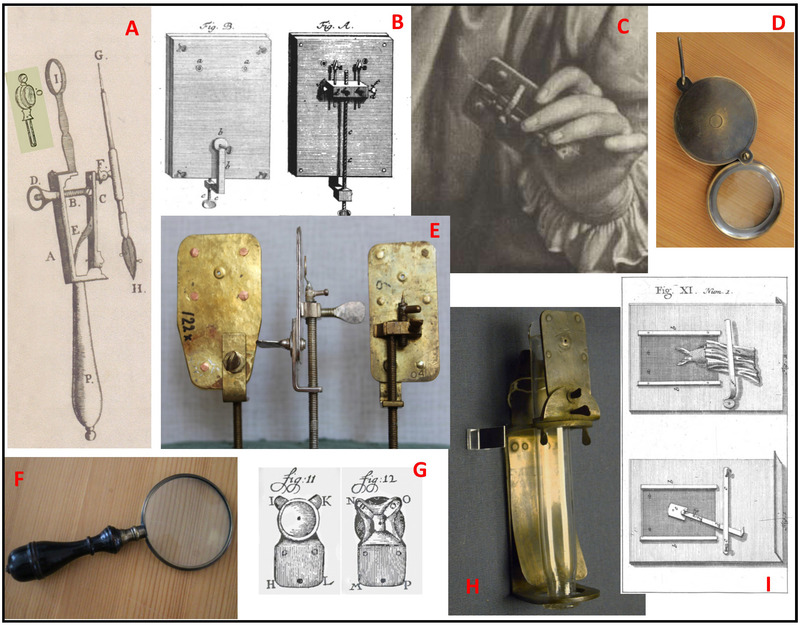 Figure 2 shows a collection of magnifying equipment that I think Van Leeuwenhoek used as his optical tookbox. The photographs show modern facsimiles, the drawings were made during or just after Van Leeuwenhoek’s life. This conclusion is based on experimental results and historical documents. A: This magnifying glass (or something very like it) appears in the frontispiece of the auction catalogue for the sale of Van Leeuwenhoek’s microscopes after his daughter’s death. Because the lens is set into a simple ring rather than the metal plate of the Van Leeuwenhoek microscope, the setting does not cast a shadow on the sample if reflected lighting is used. B: This version of the Van Leeuwenhoek microscope was published by a German visitor (Zacharius-Conrad von Uffenbach), and microscopes with 2 lenses are mentioned in the sale catalogue. With 2 different lenses side by side, it would have been more convenient than moving a fragile sample to another microscope for a different magnification. C: This 3-lensed microscope comes from an engraving made while Van Leeuwenhoek was in the prime of life, and is also mentioned in the catalogue. Note the holder for a capillary (used for liquid samples such as blood) beside the sample needle. D and F: Copies of 17/18th century magnifying glasses, as sold by the Rijksmuseum Boerhaave. “Burning glasses” are mentioned in the inventory of the Van Leeuwenhoek house after Maria van Leeuwenhoek’s death. As well as magnifying larger samples, they can be used to control the lighting of samples on the microscopes. E: Some of the facsimiles of existing Van Leeuwenhoek microscopes made by Hans Loncke and used in my experiments. G: Van Leeuwenhoek’s adaption of the eyepiece on his aalkijker to allow reflected lighting while protecting the eye with a small cup. H: A facsimile of the aalkijker drawn in Van Leeuwenhoek’s first paper on blood circulation. Note the use of the same lens plate as with the microscopes. I: His final adaption of the aalkijker to make its use easier for visitors, as mentioned by him in a letter and drawn by Von Uffenbach. People often describe his microscopes as crude, and perhaps they are when compared to other, ornamented microscopes of his time, but I suspect that Antoni van Leeuwenhoek was more interested in making something that would allow him to carry out his experiments rather than producing elegant instruments.